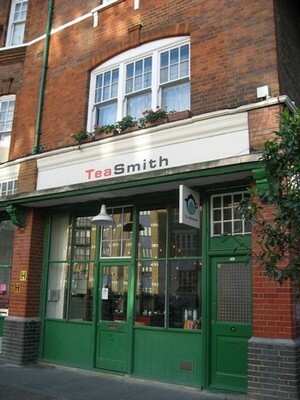 Spitalfields is now home to Londonist's new favorite tea shop, TeaSmith. This small store on Lamb Street went live in early January after a soft-launch in late 2006. Offering teas from all over the world, there's a small bar at the front where a member of staff will knowledgeably guide you through the concise menu. Our tea—a Wuyi Oolong, described as warm, smooth, and charcoal-fired—was measured out in front of us, left to steep for the required amount of time, and then served with a side of three perfectly-formed dried figs. When Londonist tried to leave, we were reminded that we still had a second infusion coming our way. For £3.50 (£5.00 with chocolates by William Curley), we happily stuck around, and then duly warmed and caffeinated, headed back out into the cold and the crowds.